Wellington Heath Parish lies two kilometres to the north of the market town of Ledbury in Herefordshire, on rising ground from 55 metres to 201 metres above sea level. The parish shares boundaries with Bosbury and Coddington Parish to the north-west, Colwall Parish to the north and north-east, and Ledbury to the east and south. Near Staplow the River Leadon and the old Hereford & Gloucester (H & G) canal cross the parish. The Welsh border is 43 kilometres away to the west; the parish is almost equidistant from the cities of Hereford, Worcester and Gloucester, which are all approximately 20 kilometres away. linear settlement to the west of the Malvern Hills, and a much smaller settlement on the eastern side of the Bromyard Road at Staplow. Other farms and houses are distributed throughout the parish, particularly on Hollow Lane and Burtons Lane (Withers Lane). 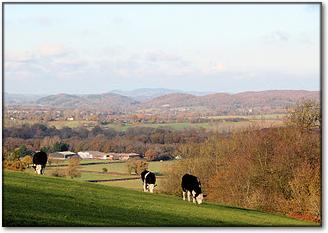 Most of the village lies within the Malvern Hills “Area of Outstanding Natural Beauty”; the rest of the parish lies within what was formerly designated an “Area of Great Landscape Value”. Part of the village, particularly along The Common, lies in a rising, shallow valley between Ochre Hill and Ledbury Road; there is very little flat land in the village! The land use of the parish is almost entirely farming, as it has been for centuries. 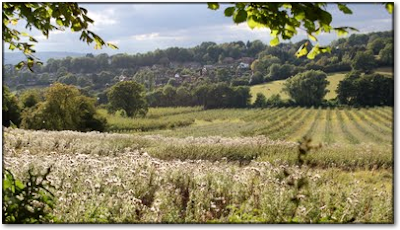 The farming land is mainly used for fruit growing – predominantly cider apples and strawberries - with some hops, arable, and livestock.